In this flat-belly salad recipe, shrimp takes the starring role, supported by crisp Granny Smith apples and a bit of red onion. The blue cheese provides a nice pungent contrast with the dressing and tart cherries, but if you prefer another cheese, by all means toss in your favorite instead! Preheat the oven to 400 degrees F. Line a baking sheet with parchment paper, and roast the shrimp for 5 minutes, flipping halfway through, until they’re pink. Set aside. Toast the almonds in a dry skillet over medium heat. Cook just until fragrant, and remove from the pan. In a large bowl, mix the spinach and arugula with the dressing, gently coating all the leaves. Divide the greens among 4 individual bowls. 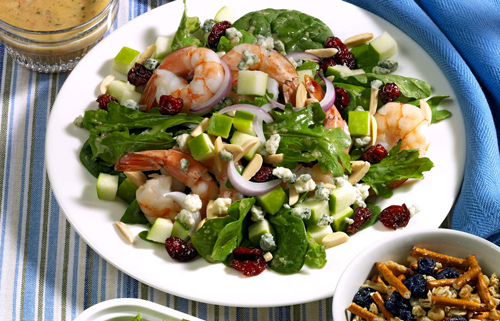 Top with the shrimp, apple, onion, almonds, cherries, and blue cheese. In a blender or food processor, combine all ingredients and process until blended. Per serving: Calories 415 (From Fat 207); Fat 23g (Saturated 5g); Cholesterol 185mg; Sodium 561mg; Carbohydrate 21g (Dietary Fiber 5g); Protein 32g.